Wonder Woman 1984 started production back at the beginning of June and was announced by Gal Gadot and director Patty Jenkins, when they both shared official pictures from the set. However, not many believed that some footage from the highly anticipated sequel would arrive at San Diego Comic-Con during DC's Hall H panel that was already packed with some heavy hitters. Aquaman is the big trailer, but just the sight of Gadot back in action may have overshadowed Jason Momoa's day in the sun, just a tiny bit. 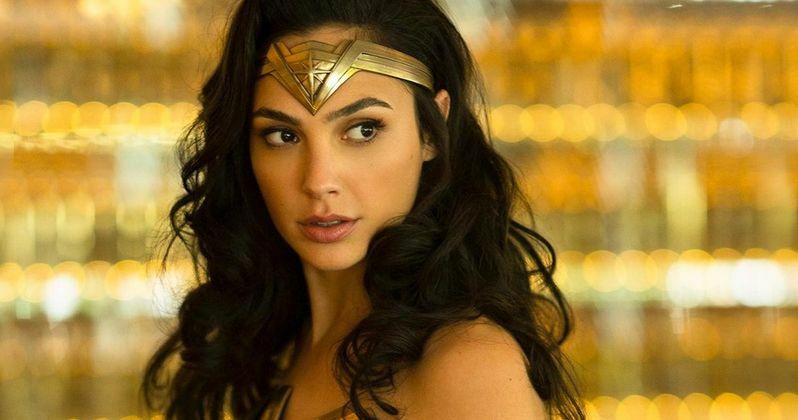 It was announced towards the end of the last month that Gal Gadot was going to be bringing a Wonder Woman 1984 surprise with her to comic-con, which led to extreme excitement. Last year's Wonder Woman is the highest grossing DCEU project to be released thus far. In addition, the movie was a hit with critics and moviegoers, so to say that DC fans were impatiently waiting to see what Gadot was going to bring to San Diego on Saturday is a major understatement. Patty Jenkins introduced the new footage, which was a rough cut of Wonder Woman using her Lasso of Truth in a mall. After the footage concluded, Jenkins said that there was no better time than the 1980s for the sequel. In the first bit of footage for Wonder Woman 1984, Diana was shown in her uniform, saving a young girl at a shopping mall from two criminals. She is able crush their guns and then pushes the girl out of the way, which sends her flying into two giant stuffed bears. Next is when the Lasso of Truth comes to play. There obviously were not any spoilers in the scene that was shown to the enthusiastic Hall H crowd, but it didn't matter at all. Even after Godzilla: King of the Monsters, it's going to be hard to top that. While some were skeptical that some footage from Wonder Woman 1984 would be shown, there is a precedent for San Diego Comic-Con being the place to be to show early scenes for big movies. Marvel Studios has brought footage from movies like Iron Man 2, Captain America: The First Avenger, and even that infamous Infinity War footage that made its debut last year at Hall H. They all came fresh from the set. DC Films and Warner Bros. even showed some brief footage of James Wan's Aquaman last year, which was when the project was still in the infancy stage of the production phase. Wonder Woman 1984 sees the return of Chris Pine as Steve Trevor, which is still a huge mystery as to how he's back after the events of the first film. There have been some pretty interesting fan theories floating around, everything from Trevor being a villain to a descendant of the original Trevor from the first film. There's even a theory going around that the latest version of Steve Trevor in the 1980s is a ghost that only Diana Prince can see. While that's an interesting theory, why would he be in clothing from the 1980s? Wouldn't he be in the clothing that Diana saw him in last? During the panel, Chris Pine was asked about his return and joked that he wasn't really there. He then said that he was not able to say anything about his character's return because it would be a giant spoiler. There's plenty more surprises about Wonder Woman 1984 coming down the wire, but DC fans are going to have to be patient since we're still over a year away from the movie hitting theaters. We'll just have to savor what was shown today at San Diego Comic-Con and wait for the release of the first official trailer. Additionally, the sequel is still in production, which means there will more than likely be a lot more leaked videos and pictures from the set. While we wait for more footage from Wonder Woman 1984 to be released, you can check out some of the news about the upcoming sequel over at Warner Bros.
Our first look at 'Wonder Woman 1984' footage at Comic-Con showed Gal Gadot whipping out the lasso of truth in a shopping mall.